Clear paint protection film covers the exterior of your vehicle primarily installed on your car hood, side mirrors, fenders and side skirts. This urethane film cover, also called a “car bra”, protects your vehicle from scratches, stains and chipping. It protects your investment, saving you the time and trouble of repainting or repairing your vehicle’s exterior after minor abrasions. Here are a few reasons why you should contact an experienced clear bra installation professional to install paint protection film on your vehicle. 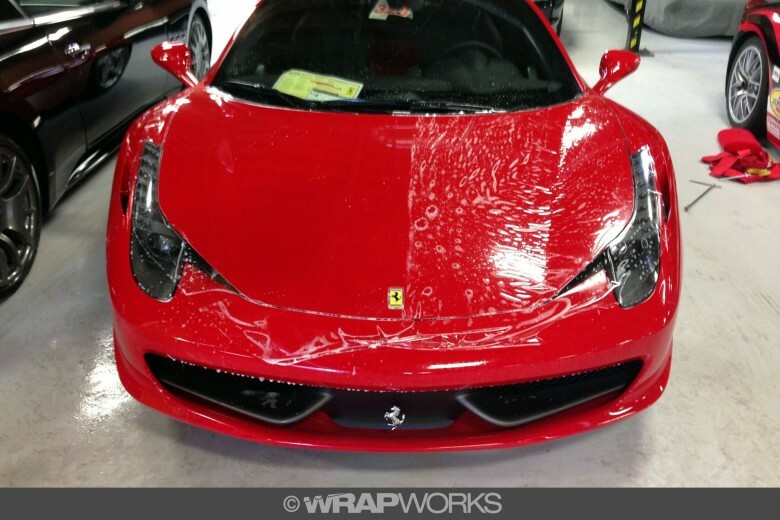 A red Ferrari 458 Italia clear bra installation in progress at Ferrari of Beverly Hills performed by Wrap Works. Frequent and even light driving on Southern California roads and freeways subjects your car to road debris, rocks, and other things that seem to be magnetically pulled to the front of your vehicle causing unavoidable rock chips and scratches. Unless you have paint protection film installed on your vehicle you will undoubtedly begin to see the damage to your vehicle. Protecting your vehicle from damage with paint protection film will keep its exterior looking good and increase resale value. A clear paint protection film covering lets your car’s finish shine through while shielding it from damage. There are many brands of paint protection film available. Be sure to choose a brand that is extremely clear and has an ultra smooth finish. The installation is a painstaking process which uses a combination of soapy water, alcohol and heat. When you use a top quality material applied by a qualified professional, you won’t even know it’s there. Clear urethane protection film has been used to protect military vehicles in areas prone to gravel and rock chips since the Vietnam War. It was originally designed to protect helicopter blades from airborne debris. Repairing the blades proved too costly, so the military developed clear film to shield the blades from gravel and stones. When debris hit the blades, it would damage the film, which could be replaced easily. The military continues to use protective films on its vehicles. The clear film was especially effective against damage from dust during Operation Desert Storm in the early 1990s. The advantages of automotive protective film were first noticed by race car drivers in the 1980s, who began using urethane film to protect their vehicles from dust and gravel from tracks and off-road races. Paint protection film is still the best solution to protecting a vehicle subject to track use. Clear bra film installation is available in a pre-cut computer designed kit or it can be custom cut and installed. Custom kits are more expensive because additional labor is involved. However, a custom cut kit offers a better fit because it the film is cut and designed by a highly skilled technician specifically for your vehicle. This provides the best coverage over all vehicle surfaces, including wrapped edges. Custom installation is recommended over pre-cut kits for a smoother, seamless look and more comprehensive coverage. It is ideal to find an installer who is skilled enough to perform a custom cut installation, especially for vintage, classic and exotic vehicles as there may not be a computer template available for your vehicle. Paint protection film technology has come a long way in recent years. The days of yellowing, faded or cracked film over time are over. Many film manufacturers now offer extensive warranty periods and at least one of them offers a lifetime warranty on both materials and labor. 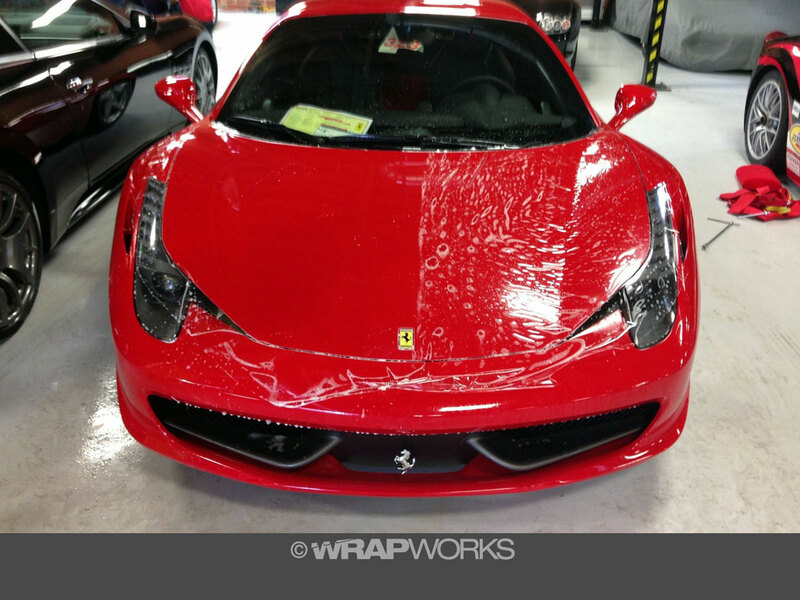 Visit us at Wrap Works in San Clemente to learn more about our custom installation of paint protection film. We use high-quality NanoFusion Paint Protection Film, which carries a lifetime warranty on material and labor. Our technicians will cut and custom-fit clear car bras for all types of vehicles from BMWs and Lamborghinis to Sand Rails and pick-up trucks. Call us today for a free quote. We serve Orange County, Los Angeles, San Diego, Riverside and San Bernardino County, and can travel to your location. Mobile service fees may apply.